1. Booking should be made wherever possible in advance of 2 hours to Airline Limousine. 2. Bookings are to be made by either phoning the reservation department, the online booking tool at www.airlinelimo.com or via the Airline Limousine app. 3. Email or fax requests to book a vehicle will not be considered a valid booking and Airline Limousine is not responsible for an any inconvenience caused to the passenger in the event that the vehicle is a no-show. 4. Fees for trips to and from Toronto Pearson Airport are charged according to the GTAA tariff sheet. 5. Fees for trips originating and terminating at points other than Toronto Pearson Airport will be charged according to the fare calculator located at www.airlinelimo.com/home. 7. Gratuities are extra and are at sole discretion of the passenger. 8. All vehicles are non-smoking vehicles. Neither the passenger nor the chauffeur is permitted to smoke in the vehicle. 9. Consuming alcoholic beverages in an Airline Limousine is strictly prohibited. 10 . Passengers are required to inform Airline Limousine if they wish to be transported strictly by sedan. 11 . Passengers are required to inform Airline Limousine if they have allergies to such things as cigarette smoke and air fresheners. 12. Requests for a non-smoking chauffeur are permitted and will be accommodated free of charge. 13. Due to logistical issues, Airline Limousine will not accommodate any requests for a specific chauffeur. 14. Van and SUV requests will be charged an extra $15.00. 15. Multiple address pick-ups/drop-offs will be charged a minimum of $15.00 per stop. 16. If passenger requests the use of the 407 ETR Highway, the toll will be charged according the 407 ETR Fare calculator. 18. Passenger is required to inform the reservation agent at the time of booking that a pet will be travelling in the vehicle. 19. To prevent any fare disputes, customers are solely responsible to provide accurate information at the time of booking including number of passengers, and the amount and size of luggage. 20. Information that is not disclosed may be justification for additional charges. 21. For a pick-up at a location other than an airport, the vehicle is required to be at the location a minimum of 5 minutes prior to the pick-up time. Should the vehicle not be at the location 5 minutes prior and if Airline Limousine has not given proper notice of this occurring, a free ride will be issued. 22. The 5-minute policy does not apply to pick-ups in the downtown core where the customer requests a pick-up from a no stopping or standing zone. 23. 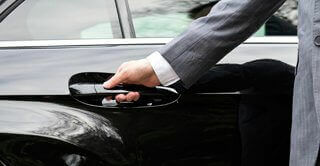 Airline Limousine advises customers to plan accordingly and set aside enough time to reach their destination on-time. Should the customer require assistance in this matter, Airline Limousine booking-agents may advise on an appropriate pick-up time and ultimately it is the sole responsibility of the customer if not enough time was allotted for the trip. 24. Customers may choose to pay by cash, debit, credit card (Visa, MasterCard, Amex) or Airline Limousine account form and are to pay the chauffeur directly. 25. Airline Limousine may refuse and or deny any booking to any inaccurate or incomplete location. 26. Airline Limousine reserves the right to suspend any booking without any reason whatsoever. 27. All sales are considered final and payment is due upon the completion of the service except in the instance where a prepayment has been made by credit card or corporate account agreement.